These were outbursts of anger and even hatred towards the police. If any part of the post-Tottenham riots had political content, this was it. The knee-jerk political responses to the England riots distracted parliament and the public from a key issue which that girl from Peckham understood: the significant and sustained misuse of police powers. In the week of the riots, when Tory MPsÂ variously demanded that rioters be detained in Wembley stadium, sprayed with indelible chemical dye, water-cannoned and tear-gassed, former minister Peter Lilley demanded that the government stick to its plans to cut police budgets. Based on my own and my familyâ€™s experiences I suggest cuts to bureaucracy would not â€”Â in Peter Lilleyâ€™s words â€”Â â€œmake the police more efficientâ€ but instead would lead to further abuses of power by the state, abuses which ultimately endanger all civil rights. 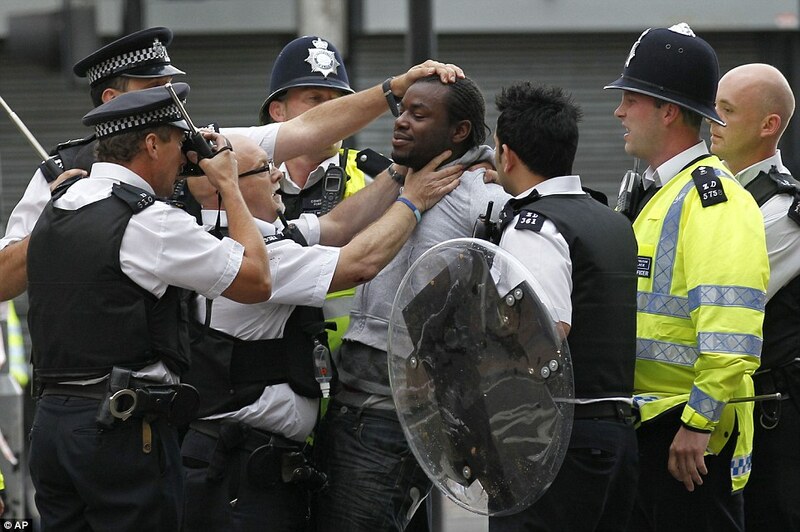 As a black man born and bred in London, I have never been stopped and searched by the police. Perhaps it is because I look like and am a computer geek, I don’t know.Â However myÂ younger brother Gus has been stopped and searched countless times. For months on end, he was subjected to sustained police harassment. It started in 2001, when he was 14 years old. Wimbledonâ€™s Criminal Investigations Department (CID) came to our home and charged him with robbery. Gus admitted taking a school friend’s house keys after an argument and explained that he had tried to give them back. The police gave him a Â final caution and warned him that next time heâ€™d be going to court. A few weeks after the robbery accusation, Gus was with friends on his way to school when plain-clothes police officers arrested him alone for â€˜causing an affrayâ€™. The Magistrates Court threw out the case due to the officersâ€™ unreliable testimony, calling the charges spurious. It got worse. Gus said he could identify which cars were following him but I dismissed that as paranoia. He told me that once police driving a car spotted him on a bus, flagged it down, marched him off and then searched him in the road. He hated walking the streets alone, knowing that he would be subjected to a â€œroutine checkâ€, as illustrated by this rap song by British duo, The Mitchell Brothers. Six weeks after the farce at the Magistrates Court, my brother and his friends were walking home from a local youth club when police sirens and lights headed towards them. “They are coming for me”, he said. His friends laughed and joked in disbelief, but he was proved right. Gus was charged for robbery of an off-duty police officer’s chequebook. As he was forcefully handcuffed on the floor, his friends attacked the police car in outrage and retaliation; two of his peers were arrested but later one was released without charge and the other was subsequently charged alongside my brother. The allegation was that Gus, with two other boys, had pounced on an off-duty police officer at night and stolen the officerâ€™s chequebook. The following morning, when my mother was on her way to collect him, Wimbledon police came to our home to search for the “officer’s missing chequebook”. My grandmother and my youngest brothers (then aged 6 and 7) were present and the youngest even had a pleasant chat with one of the officers while our house was being turned upside down. The chequebook wasn’t found but the police still pursued the charge of theft to the Magistrates Court. Gus and a friend were convicted of robbery but Gusâ€™s conviction was overturned on appeal, as it came out in the Crown Court that his alibiÂ â€”Â he said he was in the youth club â€”Â was corroborated by youth workers and the youth club register. My mother got support from the local MP, Siobhan McDonagh,Â who told Wimbledon police that she would help our family sue for them for harassment. After McDonaghâ€™s intervention â€”Â and only after that â€”Â we received a written apology from a chief constable, and the campaign of harassment ended for Gus. Is this a tragic, isolated case? I cannot produce concrete evidence that on dropped or acquitted charges, black family homes are more likely to be searched than those belonging to white or other ethnic groups. However, letâ€™s look at the context: people of African descent are seven times more likely to be stopped and searched in the UK than white people. Stop and search is a pernicious power. The received view is that it is used by the police in too blanket a fashion, and by indiscriminately selecting entire groups – young men with hoods, young blacks – causes generalised grievance. My experience is that the police use the power in a discriminating and selective fashion, singling out individuals they decide to ‘get’ and then getting them. This is not just a race issue but also a class issue. When David Starkey claimed the whites had become black, he was referring to white working class children adopting popular black youth culture. His racist claims (i.e. evil black youthÂ corrupting previously innocent whites), allude to a experiential truth: that many white working class youths of Nottingham, Manchester and Liverpool suffer similar abuses of police power and thus express similar anger towards the police. The Tottenham and subsequent riots must be seen in the context of the death of Mark Duggan, the Metâ€™s 320th death in police contact since 1990. The riots were fuelled by the perception and experience by some communities of persistent discriminative police brutality. The Scarman Report of 1981 was supposed to resolve this and now in 2011, the same issues are being repeated. The police are now allowed to arrest based on race. How did we get here again? Since the Blair premiership, tabloids – especially the Murdoch press – have portrayed The Hooded TeenagerÂ as the bete-noir of local high streets. A group of children sitting outside a shopping centre became a “gang”, and ephebiphobia (the fear and loathing of particularly working class youth)Â became a national past-time. Policing was turned on its head: crime prevention was no longer a priority â€” the police now relied on crime to save their own jobs. This perverse incentive combined with tabloid hysteria (“feral hoodies”, “chav scum”) and institutional racism, creating a climate of hostility towards young people who hung around street corners listening to grime and hip hop. After the terrorist attacks on 7thÂ July bombings, New Labour also brought in special anti-terrorism laws. David Davis, former shadow Conservative Home Secretary, recently remarked that “not one of its 100,000 stop and searches under the Terrorism Act had led to a terror-related arrest”, let alone a conviction. Â Cutting police red tape: what could possibly go wrong? This drive to cut bureaucracy conveniently forgets that much of it provides a necessary check on those officers inclined to misuse their powers. It is particularly troubling at a time when the Prime Minister has sanctioned the use of rubber bullets and water cannonsÂ and declares that our “human rights culture” is a problem. 4. Reform the IPCC: All IPCC investigations should be public unless requested by the complainant. Make the IPCC commissioners directly elected, not appointed by the Home Secretary, with powers of recall initiated through a process that involves complainants creating a petition. Enact the proposals made by INQUESTâ€™s Response To IPCC Stock Take Consultation 2008. John Terry abuses Anton Ferdinand, brother Rio gets sacked. Where’s the justice in modern football?